Thought you’d like to see a glimpse of my fan club. Seriously, these little guys totally love me. They’re like groupies (not group-ers, group-ies). Whenever I walk outside my back door into the garden, they all come as one and follow me as I walk by. They dog-paddle (fish-paddle?) at the edge of the pond and watch my every move. Or, more likely, they totally think I’m going to feed them. I like the fact that they notice me. I think it’s funny how they come as an entire group with their little mouths up out of the water looking at me so longingly. When we moved into this house a few years ago, the little pond was already there with all of these fish (a neighbor recently ‘fessed up that she had taken some of the overflow from her pond and dumped them here during the year that the house was vacant). We had moved in at the end of October and didn’t have a clue what to do to winterize a pond. We figured that the house had sat vacant the winter before and no one had done anything, so we’d just let it go and see what would happen. Sure enough, the little pond froze over and got covered with a layer of snow. We figured we’d have to skim out the dead fish and start over come spring. Then, as the water thawed, so, apparently, did the fish. By the time the Indiana air turned warm, the fish were back to their usual selves. 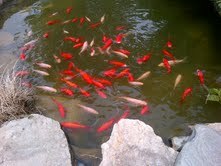 The moment I drop some fish food in the pond, I’ve got myself a fan club. Wouldn’t the writing life be nice if we just dropped a few of our choice words into the world’s pond and we suddenly had such loyal fans? Fans who waited on our every word? Fans who knew we posted on our blog every week and sat by their computer, eyes wide, mouth agape, waiting for us to toss the morsels their way? I just reach into the bag of fish food and toss the same morsels to those fishies every day. And they love me for it. I can’t do that with my writing. I’m not looking to recycle a formula or take the easy route. In my blog post a couple weeks ago, I talked about the hard work of writing. Our words matter. That’s why even though only a few people may read something we write, we still agonize over what we want to say. We want to represent ourselves well, say what we mean, write something that will be enjoyable or helpful or compelling or inspiring to those folks who take a few minutes of their day to read our musings. We do that because our writing matters so much to us. We do that because we instinctively know that the words we put out there can have a life of their own. Back before everyone was blogging, before Facebook and Twitter, I had a couple little books published. They’re long out of print, so imagine my surprise when a couple of years ago I found one of those books at a garage sale. (You know you’ve arrived when you find your book at a garage sale.) Then, a few years after that, when everyone was blogging and Facebooking and Tweeting, my son sent me a link to a YouTube video a woman had done to recommend another of my books. So I guess that’s my encouragement to my writing friends. You never know when a piece of your writing will rise again. Even if a book you wrote years ago went out of print causing you untold despair, it still lives on. I tell students in Writing classes that they never know how or when a piece of writing will inspire someone. That’s why it matters so much. That’s why we do that hard work of writing. We put ourselves out there because we have something to share and we want to join our friends in digital conversation. I’ll never know the paths my words have taken. I only know that they’re still out there with little lives of their own. Our words matter. They live on. Just like my fishy fan club. Yeah, I think about some of those devos we’ve written–who knows where those little books will make their way and who will read something we wrote and be inspired or encouraged on a tough day. I’m loving your blog, Linda. Your words are awesome! Great post and very well said. Fish are the cutest things sometimes. I feel warm and fuzzy when my goldfish nibble my finger. They probably think it’s food but eh. We writers are good at being creative. Thanks for sharing! Nice to “meet” you! I checked out your website! Great stuff. And followed you on Twitter. Looking forward to learning more together in the future! I recently wrote a short book that held my Dad’s recollections of growing up in a small town during the depression. We sold or gave away the 100 copies I had self-published. Those words — most of them my father’s — meant more to the people who read them than all the words I’ve put out there on my blog. Thanks for reminding me why I write! To me that’s the beauty of self-publishing . . . being able to “get down in print” words like that, words that would otherwise be lost. Glad you were able to do that with your dad’s memories. That’s priceless. I’m glad I found you. 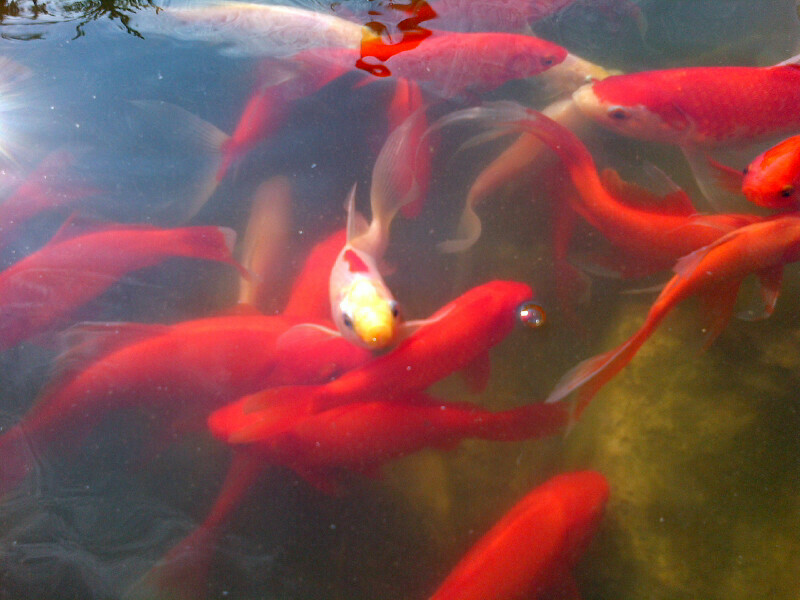 Great minds think alike as I recently posted about my own fishies here: http://tellthaiheart.com/fishes-and-flowers/ and my little guys do the same thing – crowd around me waiting to be fed! Yes, our words do matter and a nice reminder as a lot of us feel like no body is listening (or reading) out there. Thanks. Oh my! What beautiful fish you have! I love the photos! thanks for sharing. We just never know who we’ll inspire . . .